~Written and delivered by Kelli Kern at Muncie Habitat’s 2013 Dream Builder breakfast. The Johnson family learned about Habitat for Humanity back in the mid 90’s when Katiena and her husband, Roger, were dreaming of owning a home where they could raise their two young daughters who were just 3 and 7 at the time. Now adults at ages 18 and 22 years of age, Katiena’s daughters grew up coming home from the same school every day to the same home and neighborhood, where they had space to play and do homework. The Johnsons have fond memories from their early days with Habitat as they worked alongside volunteers to rehab the two-story home they would purchase. Katiena remembers feeling supported and encouraged by so many people from the community. Katiena and Roger remember feeling deeply moved and filled with gratitude when they received the keys to their home back in 1998. It became very important to Katiena to give back and ‘pay it forward’ in order for others to benefit in the same way that she had been blessed. Katiena loves bowling and has organized several bowl-a-thons to raise money for Habitat for Humanity. 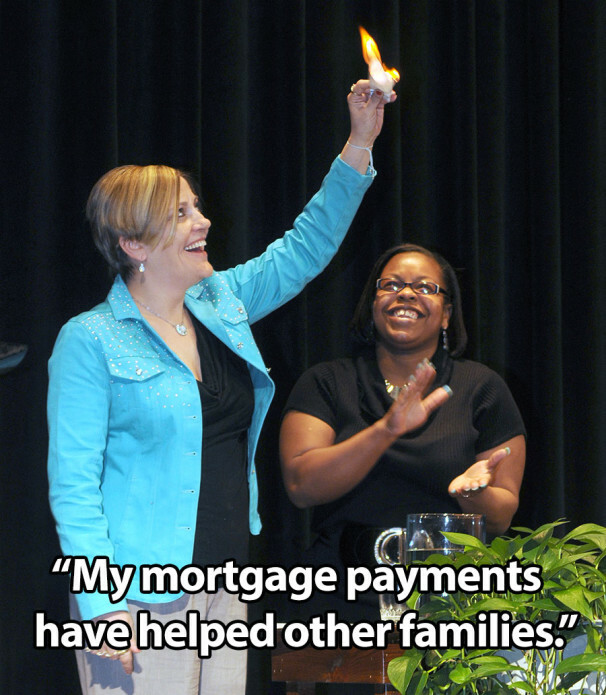 Katiena has always felt proud to know that making her monthly interest-free mortgage payments to Habitat has also been a part of paying it forward for other families. Katiena chuckles as she recalls getting several calls over the past 15 years from businesses who wanted to offer her a lower interest rate on refinancing her mortgage. She said, “I would always smile and say – can you beat 0% interest”? Katiena and her husband Roger will soon fulfill their 15 year mortgage commitment to Habitat and will be homeowners in the true sense of the word! Their journey with Habitat for Humanity is nearly complete in the same year that Katiena will celebrate her 40th birthday! This is Muncie Habitat’s 27th year of serving families in Delaware County with housing and we are beginning to see more families paying off their mortgages with Habitat. It is not often we get this many of our closest Habitat friends and supporters together in one room, but since we have you here this morning, we’d like to honor Katiena in the traditional Habitat way – with a mortgage burning ceremony!! We have a copy of Katiena’s mortgage documents here this morning, and with fire extinguishers standing by…Katiena Johnson is about to burn her mortgage papers in this room this morning! What a journey and what an accomplishment! We are all so proud of you – congratulations Katiena & Roger Johnson!!! Click here to make your $10 Difference today!